Eastern Gladiolus is not easily confused with other wild plants on this web site. 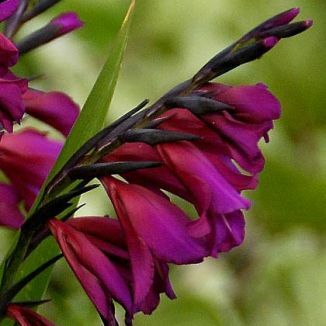 This is a small, dark purple-flowered member of the large genus Gladiolus which has only been found growing in the wild quite recently. 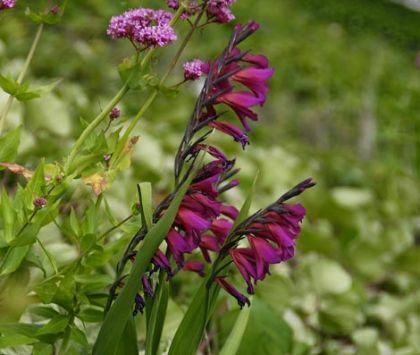 Flowering from April to June, mainly on dry, rocky or sandy ground, it stands about 50cm high and carries its handsome magenta/purple flowers (6cm long) in one-sided spikes of up to twenty blooms on stiff stems. The sepals and petals are united at the base of the flowers, the upper three petals being similar in size to one another and closely pressed, and there are dark, sharp bracts forming a herring-bone pattern behind the flowers. The leaves are sharply pointed sword-shaped. This is not a native plant, being classed as a garden escape, and it belongs to the family Iridaceae. I first recorded this plant growing along the cliff path at Killiney, Co Dublin in 2006 and I photographed it at that time. This flower is one of the larval foodplants of the Large Yellow Underwing Moth (Noctua pronuba). This beautiful moth is probably the most abundant and widespread species to visit our gardens and it also feeds on Red Valerian and the Butterfly Bush.